Choose a cause that speaks to your heart. But make sure your hard-earned money is put to its best and intended use by the agency you are supporting. In a multi-part series, Gerardine Luongo gives Index Card Cure readers her insights on the due diligence process for optimizing charitable donations. While you may give money and time to a number of organizations for a variety of reasons (think ice bucket challenge) choose at least one organization that is working in a space which you connect to on an emotional, even spiritual level. This is so very important as you are more likely to stay with an organization that feeds your soul for the long-haul. Because it costs money to obtain and retain donors, the more donors who stay with the organization, the more stable it becomes. Conduct due diligence. Do your homework. It is likely that a number of organizations are working in the “space” that speaks to your heart and choosing one over another may not be easy. Conducting due diligence is a way of narrowing the field. Financial accountability. A solid non-profit will publish their 990 tax forms on their website along with their annual audit report. Some may indicate that these documents are “available on request.” You shouldn’t have to ask for transparency. Know what you’re looking at –a 990 is not a tax return form it’s a form that declares the organizations income/revenue and its expenditures. It includes the salaries of senior officials along with the sources of income (donations, grants, fees-for-service). A ton of information can be found on the internet about accountability but here a few key points. Understand Overhead. Overhead or operating costs are much misaligned and misunderstood aspect of non-profit expenses. It costs money to run an organization. Salaries are a big part of overhead as are fundraising costs, travel, rent, etc. In general overhead should be 20% or less of the total budget. If it’s more than 25%, dig deeper, ask about it, and compare it to other organizations providing similar services (it may be typical for that type of service or the program may have higher costs such as rent as it needs to be in a certain location). Don’t be afraid of fundraising costs. This is akin to the for-profit cost to obtain and recruit a customer. It is expensive to recruit and retain donors and grant funds. Of course, unless the non-profit is a start-up, then fundraising should never exceed revenue. Respect Salaries. Just because an agency is a non-profit does not mean its employees should be underpaid. They are choosing to work in an important field and compensation is as important in this setting as it is in the for-profit world. If a CEO is managing a $ multi-million organization, that person should be paid accordingly. Good people should be paid for their work. At the same time salaries need to be in keeping with program expenses…which brings us back to a reasonable overhead rate. “100% OF YOUR DONATION GOES TO THE CHILDREN/FAMILIES/ANIMALS WE SERVE” There is ONLY one situation for which this is a completely accurate and clear statement. This is when an organization has a donor/benefactor who fully funds its overhead expenses. When this is the case, the organization will clearly state that all overhead costs are supported by a funder. If there is no clear benefactor, then this statement is false or at least misleading. This statement may be technically accurate if you consider that 100% of expenses ultimately do go to serve the clients. That is to say that the rent on headquarters, the paper, etc. are costs that go to the client. But that is not how most people interpret the statement and a good non-profit makes that distinction. Revenue. Revenue as found on the 990 includes donations from individuals and organizations as well as fees charged for services. Fees-for-services (FFS) are often charged on a sliding-scale based on income and are key to organizational sustainability. Don’t turn away from organizations that charge for their services. Your donation underwrites those services but probably will never fully fund the organization. FFS also have a great impact on the clients served. Fees allow families and parents to maintain their dignity. These fees can help shift a community from total dependence on charitable services to a system that allows communities to develop sustainability. This can be true even in the poorest communities. The 990 also lists major donors (over a certain amount). Knowing who the other donors are may provide some insight into who the agency attracts and if you share a value system with other major donors. • 100% of your contribution goes to those we serve–really ??! 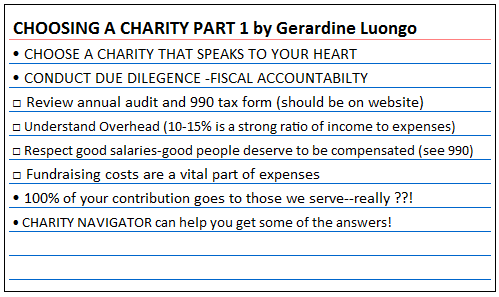 • CHARITY NAVIGATOR can help you get some of the answers! In an forthcoming post, Gerry will provide guidance on Programmatic Success. Gerardine Luongo is a 30 year veteran of the nonprofit community where she has worked at all organizational levels including executive leadership, program management and evaluation, and senior development positions. For the past ten years, Ms. Luongo has worked with several international aid organizations promoting health and educational programs throughout the developing world. Her work has brought her to countries across Africa, the Dominican Republic, Haiti and Afghanistan. She has published work in professional journals and on the blog sites of magazines dedicated to social justice. Ms. Luongo is married to Don Ranft, an engineer and patent attorney, and is the step-mother of three adult children who are all successful in their chosen fields.In an forthcoming post, Gerry will provide guidance on Programmatic Success. December is when people make a third of all charitable donations. But it can be hard to know which charities will actually help people as opposed to helping you feel better.